This weekend has been an adventure. So my best friend from college (I subscribe to the Mindy Project theory that Best Friend isn’t a person, it’s a tier, and I have three, all of them very dear to me, even the Assorted Other) is getting married in May. Agnes has always been a giant nerd. She’ll squint at me for putting it that way, but she’s a history buff who loves architecture and old furniture. Seriously. NERD. But it’s neat because she’s so enthusiastic about it, too, that thanks to her I’ve learned about architecture and old furniture. I claim to know less than I actually do. At any rate, she’s never been one to pick out all of the details of her dream wedding, being busy dreaming about traveling and old things like buildings. And now she’s embarking on a big wedding (she has a giant family) with a maid of honor who hasn’t worn a dress since 2011 (yours truly). But I’m getting ahead of myself. Friday night was one of my favorite events: the Nice Girls meeting where we take a look at the upcoming season and decide what’s worthy and what isn’t. I’m on the superhero beat this year, with Arrow and The Flash. I figure that’ll tie in well with my book, plus I enjoy mocking Oliver Queen. Recaps will begin after I get back from New York. I’ll link them here in the blog and in my newsletter, the first of which is coming out October 16th. Oh, Saturday. So the good news is that the migraine meds my doctor gave me work in half-doses because I woke up at 7 with a doozy of a migraine, which would’ve made Saturday not very much fun. I met Agnes and her various family members at a wedding dress store at 9:30. I’ve read critiques of the wedding industry before, but I always forget how all-encompassing it is. People wait to rush the doors when the store opens. Inside, brides-to-be parade out in front of a gaggle of their lady friends on a stage, with fancy lighting and mirrors everywhere, while assistants rushed to bend to every whim, all assurances and good humor. Agnes has several friends whose names begin with the same letter as mine and her family has a hard time differentiating between them, so I earned the designation of “The Funny One” early on. I try to live up to it every chance I get, and it helps to have a good audience (especially when you call the beaded belt “The WWE Belt”). She didn’t find The Dress (I’m told it’s an experience), but she narrowed it down. I’m very sad I’ll have to miss the second shopping excursion, but I’m told bridesmaid dress shopping is in my future very soon. Afterward I went on a hunt for a messenger bag (no luck) since my Carol Danvers bag won’t be ready in time for NY, and met up with Agnes and her family for lunch, which was delightful. They insisted I need to do author events in her hometown, which is exciting. (By this point, I have driven about 60 miles) I swung home (30 more miles) to say hi to dogs and brother, and then met up with my sisters at the Strange Folk Festival (25 more miles). This is, hands down, my favorite event. Local vendors show up and I always find the cutest things. I have a Batwoman luggage tag, a really cute shirt for the Dragonlet, and my own new favorite shirt, which depicts a Boston Terrier wearing a ruff from the Culture Flock (they have a Boston named Pig, so we bonded). 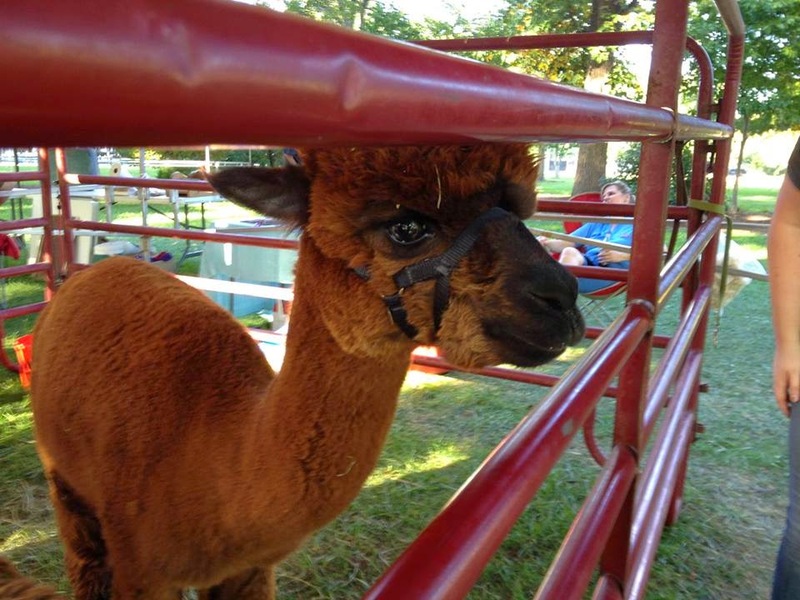 Local artisans bring alpacas and their spinning wheels and drop spindles. 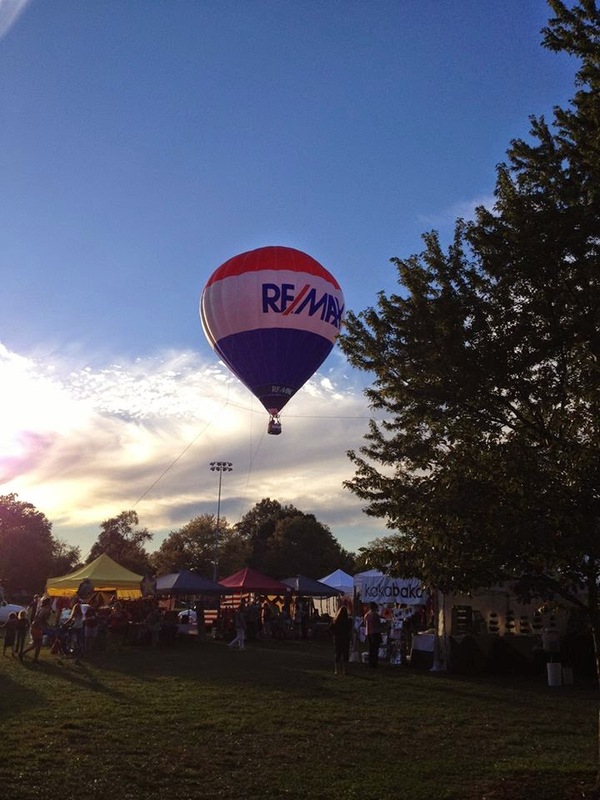 There was a giant hot air balloon that I just called “French” before I realized it was a giant display for RE/max. They were taking people up in it, but Agnes had promised to help me find some outfits for NY, so I had to run without even purchasing Kettle Corn. Soooo…back across the river to meet Agnes and her fiancé at the mall (30 more miles), where we admired a She-Ra T-shirt before she dragged me to get actual, adult clothing (I was down to one pair of jeans). I actually heard my bank account scream when I swiped my credit card for all of my new clothing. I OWN A DRESS. The last time I wore a dress was in 2011, people. This is a Big Deal. So I went home and crashed because super long day (total count was something like 125 miles). Yesterday was great, too. My friend Daroos earned her PhD (SHE’S A DOCTAH!) on Friday and so I went to meet a bunch of fandom friends for brunch by the Anheuser-Busch Brewery, where I was also introduced to a St. Louis institution that is Gus’s Pretzels. I have also learned that I need to go to the Art Museum and see the “How YOU doin’?” Chinese statue, and that even with the construction going on, taking 70 West along the riverfront is still the most gorgeous view of the Arch you’re going to get. This is such a great photo I had to close my eyes to keep it from being too perfect. When I got home, I took a break to recharge before I began to get ready for next week’s move. I won’t be getting boxes until Wednesday, but I can prep everything. I’ve discovered I own 4 Hawkeye Brownie cameras in GIANT YELLOW BOXES, so if anybody wants one, please get in touch. All I would need from you is shipping, seriously. I also have an SD-Card reader for the iPad, a Fushigi mirror ball, and three batteries that fit a Canon EOS camera. Willing to send to anybody willing to pay for shipping. Nothing on the blog Thursday except the surprise, so I’m doing my weekly roundup today instead of then. How was everybody else’s weekend?? Tell me stories in the comments, sometimes I feel like I’m shouting into the void. This week’s music obsession: The Piano Guys and Lindsey Stirling! Mama Dunne and I will be seeing the former on October 19th (her birthday present), and I can’t wait. Hullabaloo has about 60 hours left to go and is up to 376k. It hit some really fun stretch goals this week, and I can’t wait to see the films. My friend Bart Elfrink has two films screening at the MX Theater in downtown St. Louis on October 3rd at 7pm if you’re in this area. He says there will be free beer, so get there early. Last week was Laurel Lance Appreciation Week on Tumblr, which was glorious. Ladies of Arrow Appreciation Week starts on Wednesday! I’m hoping there’s lots of love for Nyssa, Laurel, and Thea. I love this breakdown that Mulan was actually the Great Stone Dragon/her family’s protector all along. There is a dog that brings you back things you lost at the airport!!!! THIS IS NOT A DRILL. Check out the Expedition 42 Crew poster. Now there are some Hoopy Froods who always know where their towels are. Mama Dunne buys me old cameras at every garage sale she can find. So I have a crazy collection. But yeah, if you want one of them, it's yours. It'll cost about $30 to ship to Ireland, I think? Is that okay? wait a minute! Do I get some Irish lace out of the deal? I miss fandom. Can't wait to trot you out to the NaNoNewbies as our region's first published author!